Gentle Readers, wow, what a week. 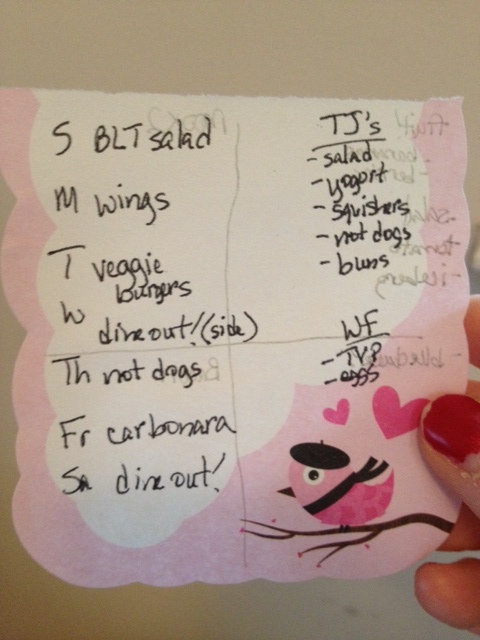 I managed to sit down to eat 3 or 4 actual meals in the span of a week–the rest were food grabbed on the run. Not to downplay the awesome that is Barcelona, but work travel is not the same as leisure travel. Being immersed in a different food culture always makes one think about their own. Ham and cheese with a side of cafe con leche from Tapa Tapa in Barcelona. 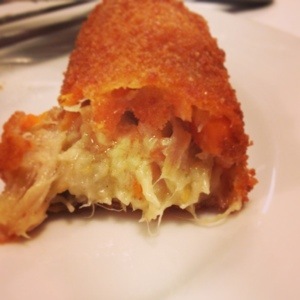 My favorite from the week: a chicken, vegetable, and cheese croqueta from El Canalla. In a random chance, I also had a rather interesting conversation about sustainable food with someone high up in one of the major international food corporations. We talked about Michael Pollan and the tension between profit and sustainable, especially as pertains to meat. I don’t envy him his job. Fresh ingredients fill the markets in Barcelona. But I digress. Look for inspiration from Barcelona appearing in posts for the next few weeks. I respect a culture that is not fussed about diet crazes and every new trend. Barcelona has strong foodways that are built to be flexible and incorporate new traditions. I love that. Visiting always makes me want to go back again. 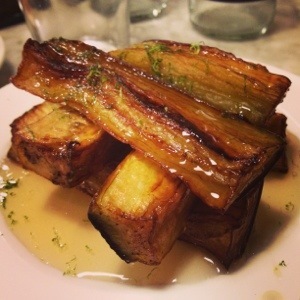 Eggplant fries with honey and lime from El Canalla. OMG good. I’ll be eating whatever TPC’s Mom left in my fridge. Surprise! Sometimes, even oatmeal or cereal is enough after traveling. Figs and cheese? Tomato bread? Prosciutto and melon? I’m not sure what I’ll combine, but it will be small bites of whatever is in the store. 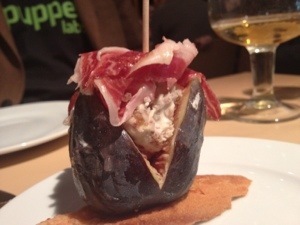 Fig filled with marscopone and jamon from Cervezeria Catalana. Simple and direct, one of our favorite easy meals. We’ve got a lot going on this day. One of my favorite easy meals courtesy of Trader Joe’s. Served with a green salad, and you’ve got a multi-colored delight for dinner. It’s worth browning some sage in butter–it’s just fun. Using up the last of our leftover veggie chili, I’m pouring it over chips, topping it with cheese, and serving it up with a side of guacamole. This might be our N.C. State Fair Day, and we have a long list of things to eat. Apple fritters, corn, fried okra, and whatever the “it” thing is in deep-fried. We are so ready. 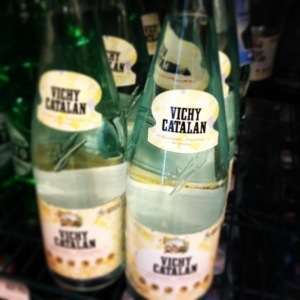 Ironically, I never saw this brand of water in Barcelona, but saw it promptly in NYC upon landing. 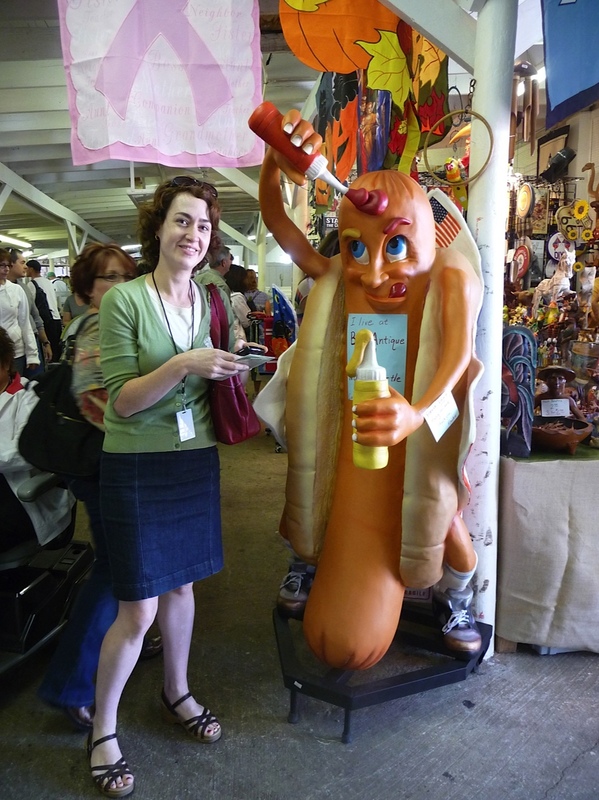 Have you been to your state fair already? What should we find and consume? No deep-fried goodness too strange. We’ll try it on video even. Post your challenge below! 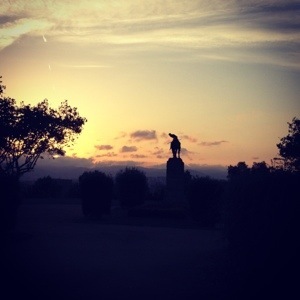 Farewell Barcelona, see you next time. 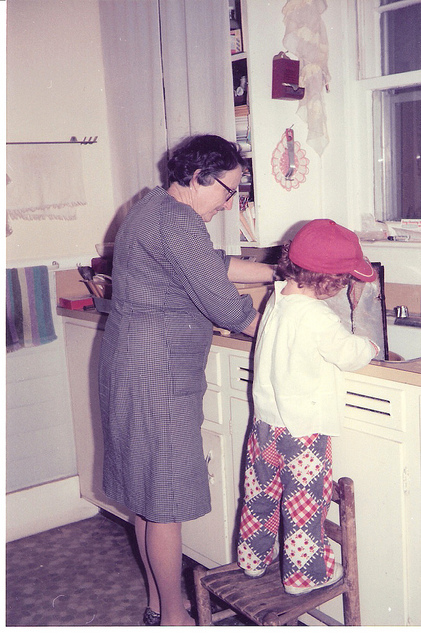 Gentle Readers, sometimes an act of rebellion is as simple as cooking a meal. This has been a hectic week–we’ve been fighting fall colds and prepping for approximately 1 million cool things that we here at Team Practical Cook hope to do in the next few weeks (pumpkin patch, N.C. State Fair, Neko Case concert, travel, soccer, Halloween, you name it). In my spare time, I have a big girl job that demands a lot of my time and TLC. Says it all. 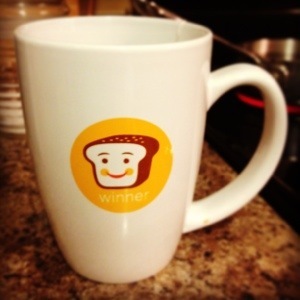 My new favorite mug. The other night, I shut the laptop, locked the phone, and cooked. It felt great. 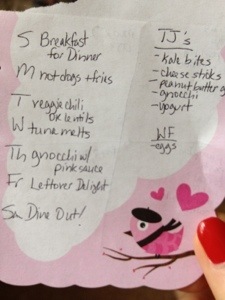 The girls are amazing and supportive eaters, and don’t mind that we sometimes eat odd pairings (veggie chili and pumpkin cranberry scones anyone?). 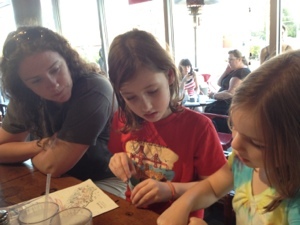 We always eat together, even if it’s a few bites, or our new highly experimental Italian sodas, or in the car. 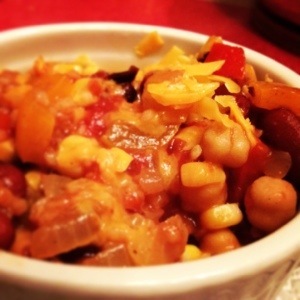 Veggie chili, now with chickpeas. My act of defiance of life’s pace was simple. We just stopped for 30 minutes and cooked and ate. Nothing requiring an act of Congress (all shutdown jokes aside) or a great shift. I prioritized. I need to do that more. Right now, I’m scrambling to get ready for another business trip, this one international, and this blog is going to be paused for a week. 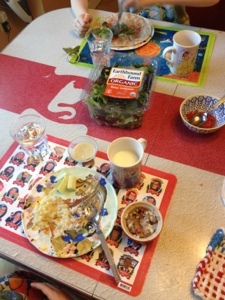 So forgive this break in form–I encourage you all to stop and cook, no matter what you have on hand. It doesn’t have to be fancy, or even really go together. Just push pause for a minute and eat together. I’ll see you in a few weeks. Be sure to check me out on Instagram (@amylewi) or follow me on Twitter (listed below) for some food stalking from Barcelona. I can taste the tapas now. See you NEXT SUNDAY for Weekly Menus! Gentle Readers, another week, another road trip. One of the biggest challenges is coming home to an empty kitchen. So I try to shop and plan accordingly. I’ve been stocking the pantry with healthy snacks, and we’ve got fruit in the fridge that can last a bit longer. 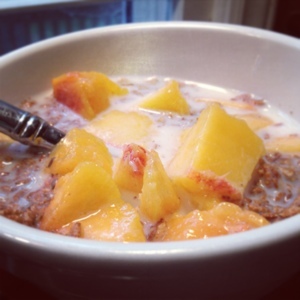 Peaches: I’m addicted to you. I’m eating peaches and nectarines like it’s my part-time job, so no waste there. Quesadilla fixings hold for a bit, so that’s also at the ready. And eggs, which I waxed on about last time, are always there. 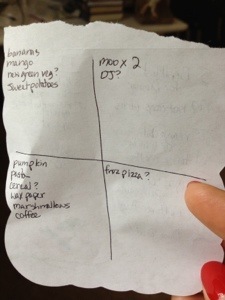 So the very light Four-Square Grocery Shopping List: milk, bread, eggs, fruit. On hand, Almond Bars, cereal, pasta. I can live a long time on these things. It’s like shopping for a snowstorm, only add fresh items. I am Southern you know. Otherwise, rotisserie chicken would be my dinner weapon of choice. 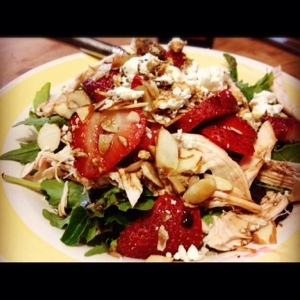 Speedy Salad: Strawberries, rotisserie chicken, almonds, goat cheese, greens. That’s what it’s there for. Just add salad and fruit, welcome home. This has been a real break-through this summer. 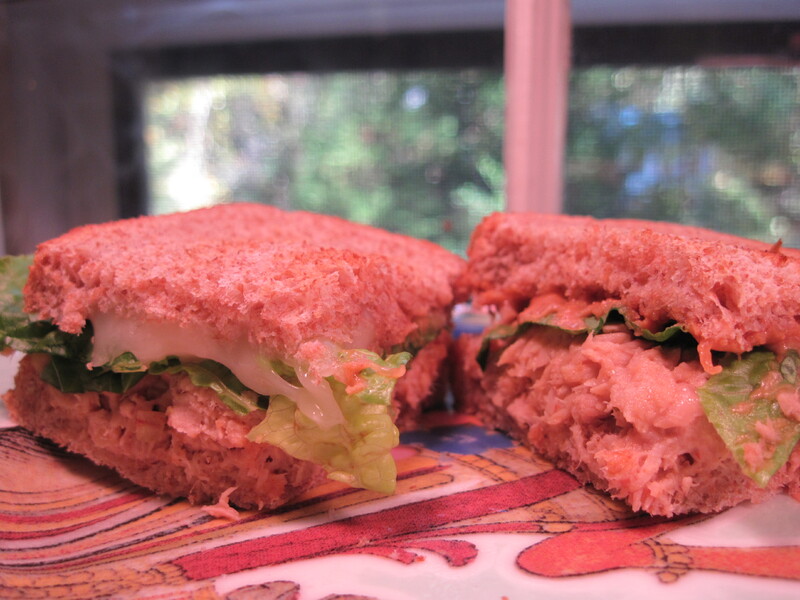 We’ve done tomato, tuna, egg salad, and more. I think the “stuff to bread” ratio is much better, and we fill in the blank with celery, carrots, salad, fruit. It’s working for us. 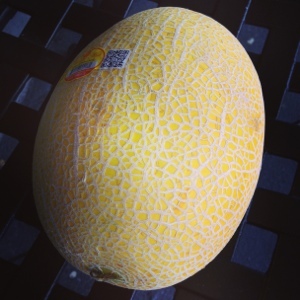 Some nice person gave me a canteloupe at the car wash. It’s a hybrid of canteloupe and honeydew. Delightful. This is podcast night, and I need to make food efficiently so I can get on air. Making anything in a cast-iron skillet makes it feel like homemade to me. 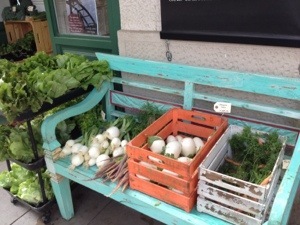 We got a garden-load of veggies from TPCs Parents. Looking forward to some combo tossed with pasta. Simple and to the point. 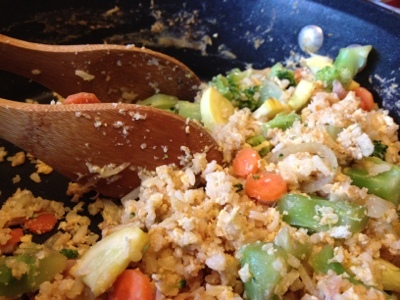 I have some frozen rice leftover, eggs, and more vegetable bits. Add soy and ketchup, steam some edamame, break out the chopsticks. Send your dinner inspiration my way! It’s almost time for school again, so we’re warming up the lunchboxes. What are you cooking? Post a comment below! 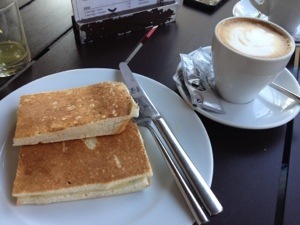 Gentle Readers, sometimes one goes clear across the country for comfort food. In a week of extreme eating (and I do mean extreme, starting with a meat cone and marching across many scones and some chocolate), simplicity won my heart. The Practical Cooks Junior and I went on vacation to San Francisco, staying with family in Oakland, and eating with many friends along the way. 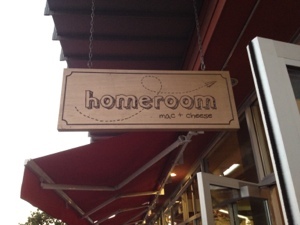 Our last meal abroad was at Homeroom, and it was spectacular. 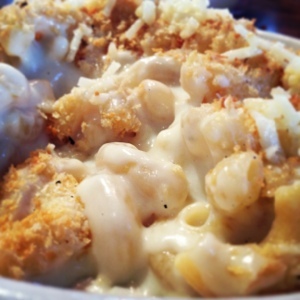 White Cheddar Mac-n-Cheese with Bread Crumb Toppings from Homeroom. The restaurant serves macaroni and cheese. Plus vegetables. And that’s really it. Well, plus drinks and beer. There’s a good bit of bacon too. I respect that in an establishment. Here’s what I liked about the place. Kids portion of traditional creamy cheddar mac-n-cheese. So fantastically good. 1. Clarity of purpose. Do something and do it well. I knew what I could eat before I went. It was reasonably priced, and I was delighted to eat the White Cheddar Mac-n-Cheese, with optional crumb topping. 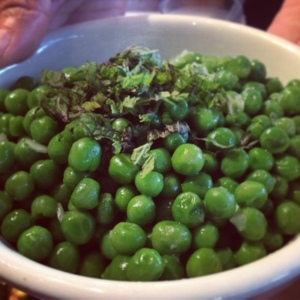 Hello minty peas, so fresh and full of vegetable goodness. 2. Infinite variety. 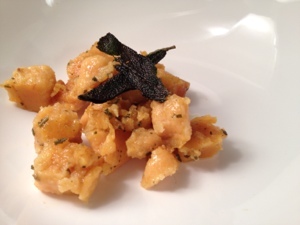 Though the menu is focused, you can alter and amend your mac-n-cheese ad infinitum. Bravo. Next time I’m getting the garlicky gouda or the truffle and mushroom. Hipster atmosphere for the win! 3. Strong vegetable sides. In a world of starch and cheese, it would be easy to fall victim to a junk food mentality. Not at Homeroom. 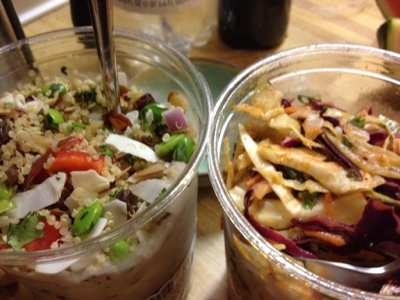 There are several salads and a few main veggie sides. Again, all reasonably priced. We got minty peas and bacony Brussels sprouts: wow. The Youngest could not shovel peas in fast enough. The Eldest launched a full assault on the sprouts. After a week of eating lots of travel food, it was a welcome respite. 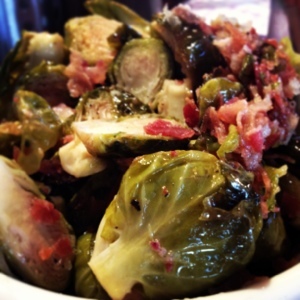 Go ahead and drool over these bacony Brussels sprouts. I’ll wait. 4. Just desserts. I only regret I lacked the stomach to try more desserts. We had this peanut butter pie, and it was outstanding. 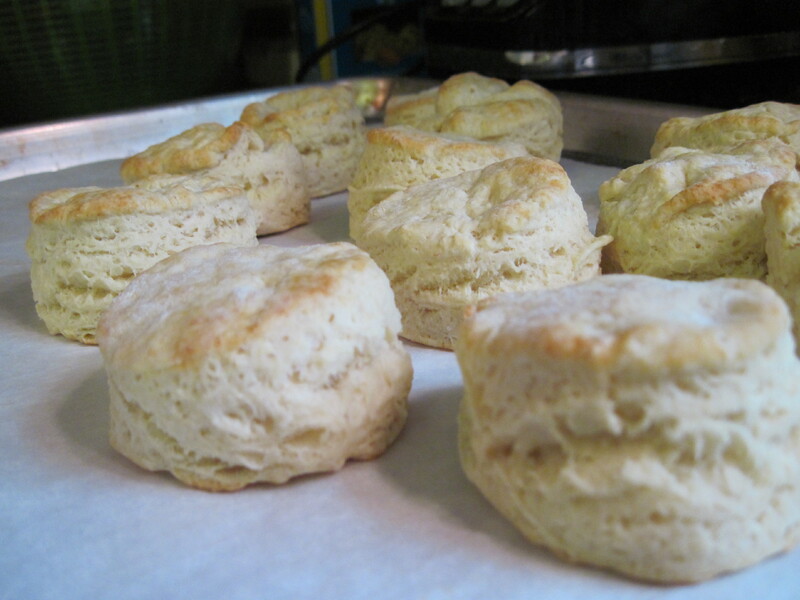 A little salty, a little sharp from either sour cream or cream cheese, and well balanced with the graham cracker crust. I will dream of this. The homemade salted oreo is also highly Yelp recommended. I hope someone will eat that and let me know. I will be back for it. 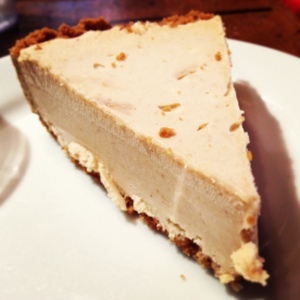 Peanut butter pie was not overly sweet, but full of flavor. No crumb left behind. 5. Beer selection. Again, so often it’s easy to try to do everything. Here, they do a few selections that rotate, and they’re diverse and good. Plus they do crazy combos like a lime plus beer shandy. Too sweet for me, but A for effort. Beer and mac-n-cheese may be my new favorite combo ever. 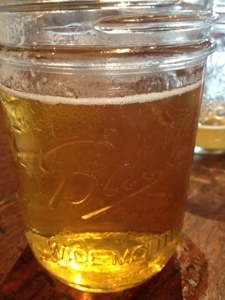 Simple summer ale, wide mouth Ball jar. Made for each other. To conclude, this is run don’t walk. 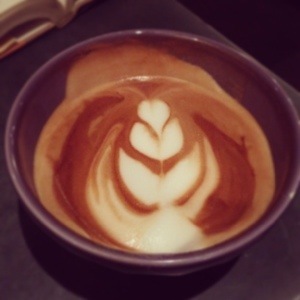 The place is hipster central, but without the snark that so often accompanies it. I do like that about California in general. 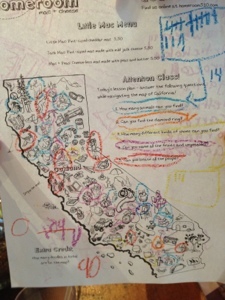 Right down to the kids’ menus they hold to theme–it was like homework. TPCs Jr were enthralled. They served the veggies first. Genius. 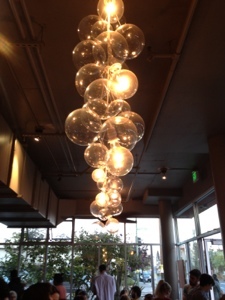 Great service, cool atmosphere, rocking food. I will confess, I tried the bacony mac-n-cheese, and didn’t love it. Too smokey for me. I know, a bacon lover’s sin to say so in my out loud voice. It was me, not them. What do you think of themed restaurants? 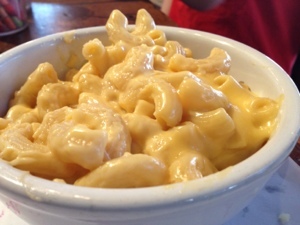 Do you love mac-n-cheese? What’s your favorite combo? Post your comments below or Tweet my way! Great to be back, and more recipes and reviews are coming your way soon. Special thanks to my crew of tasters. Gentle Readers, it is serious confession time. I love the Whole Foods salad bar in a way most people reserve for God and Country. I love the variety. I love that I didn’t have to prep 1 million individual ingredients. I love the fresh crispy vegetables and the potential of using squash casserole as a topping. Shredded beets and two cubes of tofu, yes please. 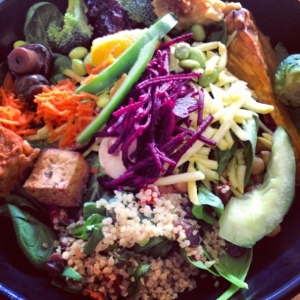 Whole Foods Salad. That’s right, squash casserole. Don’t judge. Here are my tips to making the most of your trip, without taking out a second mortgage. 1. Limit the salad dressing. Nothing cranks up the cost like too much dressing. Also, it overpowers your careful selections. Let other things flavor your salad, like couscous, quinoa, egg salad, fruit, etc. 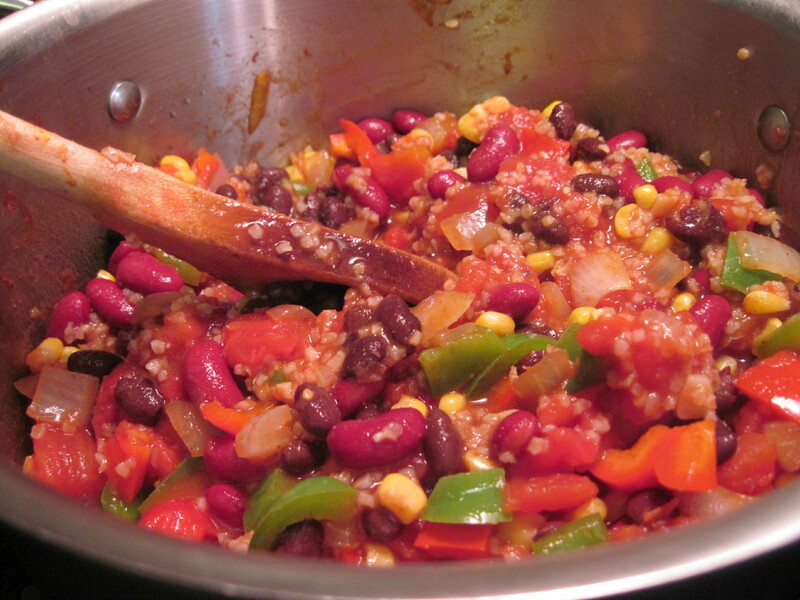 Quinoa can add flavor, and is typically already dressed. Whole Foods Salad. 2. Diversify your offerings. There are so many things from which to choose, don’t get caught loading up on any one thing. If the salad is just for you, take one of each kind of tofu, one tomato, one broccoli, and so on. Yes, that is squash casserole on top. 3. Don’t skip the hot bar. The vegetables don’t stop at the edge of the salad bar, try steamed green beans and asparagus, cooked carrots, salsa, squash casserole (can’t recommend that enough), the sky’s the limit. 4. Meat is salad too. This will cost you your weight in gold, so limit the addition. However, the smoked meat bar is perfect for a single wing, a portion of brisket, or the top of a rib (skip the bones). 5. Sweet, Crunchy, Salty. 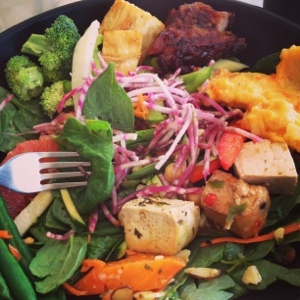 The best salads are balanced in composition. Look for different ways to bring color, texture, and taste. Try unusual combinations. If you’re stuck, employ your kids to assist. They don’t come with the same barriers and restrictions you do in terms of “right” and “not right.” Be prepared to eat some combos that would be best on Man vs Food. My favorite right now? Adding a piece of fried yucca on the top. Whole Foods Salad Bar, I love you. 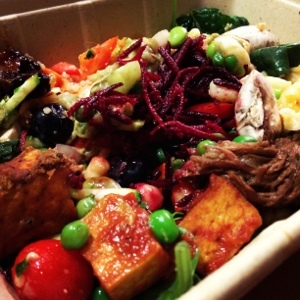 What’s your favorite trick or foodstuff at the Whole Foods Salad Bar? Post a comment here or on the Facebook page, or Tweet my way! 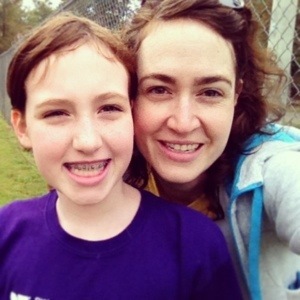 Gentle Readers, today’s post is about habits. For better or worse, we fall into them. Today, having gotten used to not blogging after a week’s hiatus, I almost forgot to post this. That’s how quickly a habit can change. Equally true are good habits. I never ran a step in my life that wasn’t required by a class or a rabid animal until I started attempting fitness a few years back. 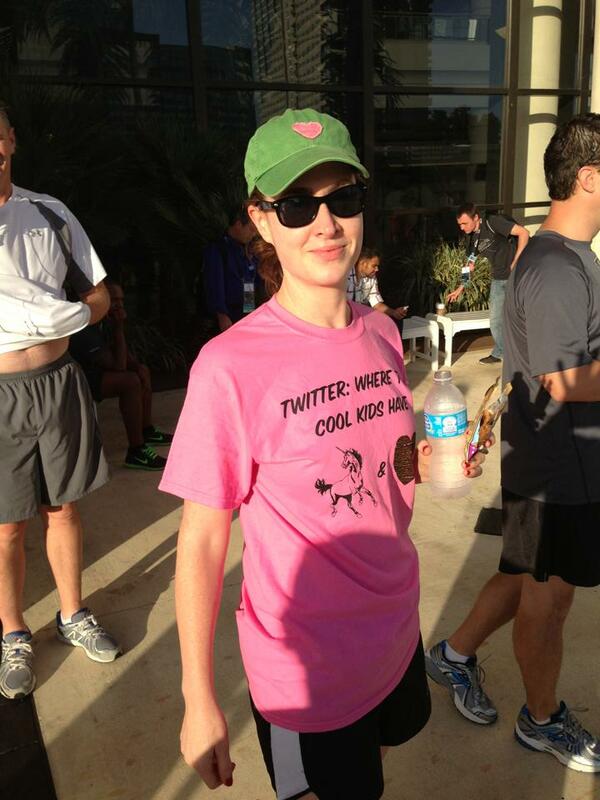 My Third Race: 5k to Benefit Wounded Warrior Project! Now I feel itchy if I don’t try to run. Slow as I may be, I’m still faster than the couch. For my confession: I’ve fallen out of the habit of going to the farmer’s market on Saturday mornings. I miss it. I know there are ingredients waiting for me there. It’s easy to go into neutral and coast. I want to fight that. So I’m confessing here. Next week is another chaotic ride, but I’m going to do better. 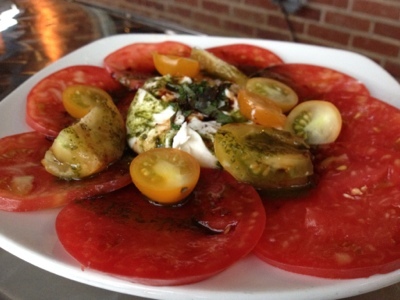 Celebrate your independence from hothouse tomatoes! Bring on summer! 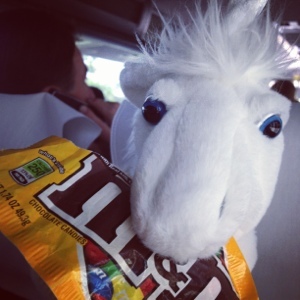 It’s easy to survive on Peanut M and M’s, but I need more salad. 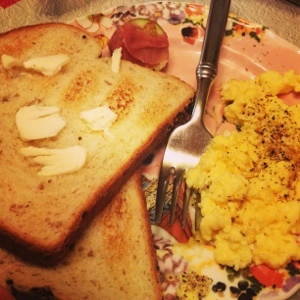 It’s great to go out to eat and try new things, but I miss my kitchen. I think it’s time to host a dinner party or a tea (or perhaps a lemonade and cookies function in honor of the heat). The Jrs and I can wear party dresses and I can remind myself why I love food. So back to better habits, which can form as easily as the bad ones. Thanks to everyone for riding this ride with me. I appreciate your feedback and support. It makes all of this possible. My dinner twice last week. 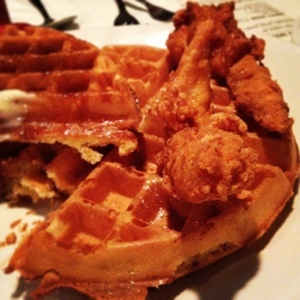 Chicken and waffles! 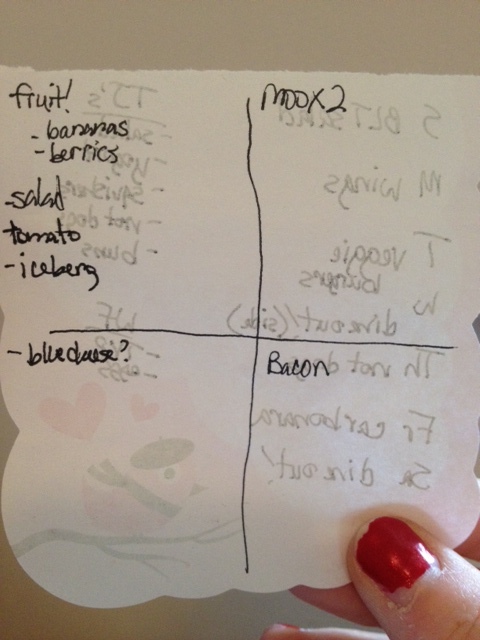 After being mocked for eating a low-bacon to lettuce ratio, I’m hitting the test kitchen for this one. Stand by. I may make them, I will eat them. But I’m not going to skimp on the celery and the carrots. I crave food found in nature right now after weeks upon weeks of insanity. Tis the season for grilling out. I actually like these as well. I know it’s a bit of a cheat, but I’ll make the sides from scratch, and there will be fruit on the side. We’ve got plans, and I look forward to them. More on this as they emerge. Team TPC is doing some exploring. Can you tell I’m on a veggie kick? I was also challenged to find new ways to use TVP. I’m thinking about this, and it reminded me to make a batch of hot dog chili with the stuff. It’s a particularly Southern thing, more sauce that foodstuff, and perfect vegetarian junk food with slaw on a not dog. 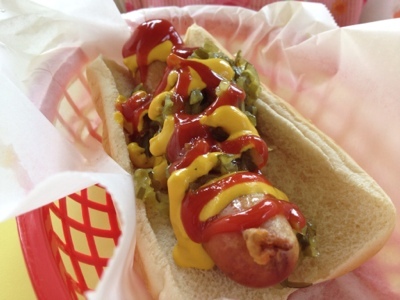 The iconic hot dog who applies condiments to itself. We’ll have bacon in the house, and this meal is a great end to the week. Comforting, filling, and a reminder that we’re home. We are hitting up a new country, let’s find out which one. I’m voting Korea. Does summer change your habits for better or for worse? Confess here, I’m listening and probably guilty of the same. Post a comment below. 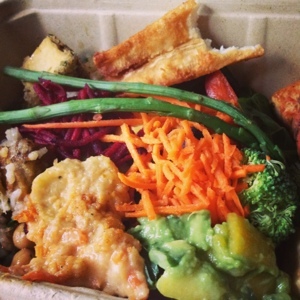 Up next, The Whole Food Salad Bar, A User’s Guide.